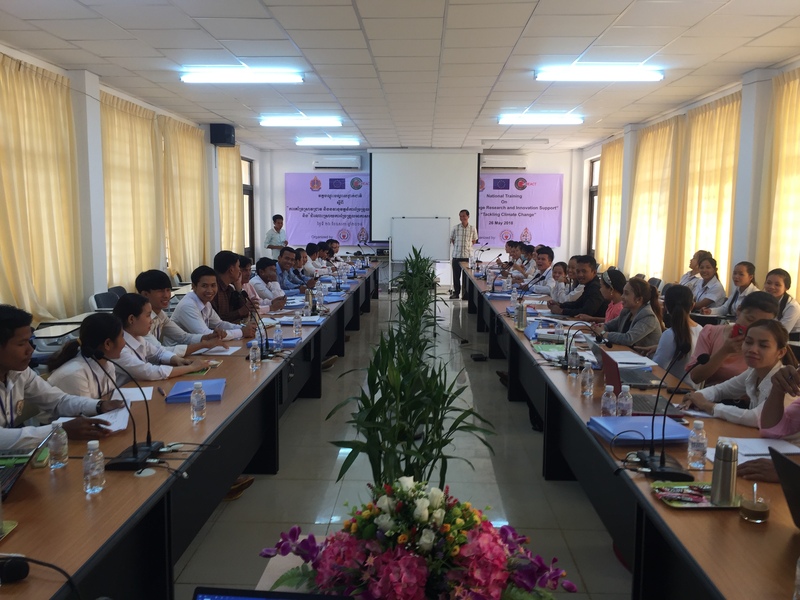 Home > News > 1st National Training in Cambodia on "Impact, Adaptation and Risk Management Strategies in Climate Change"
The National Training on “Impact, Adaptation and Risk Management Strategies in Climate Change” has been organized by REACT Partner from the University of Heng Samrin Thbongkhmum (UHST), Cambodia on 26 May 2018. The trainings are part of the REACT project which is funded under ERASMUS+ KA2-CBHE. The participants were undergraduate and postgraduate students, researchers, and lecturers from host institution, manager of HEIs external to REACT, policymakers from national levels, local authorities, including Provincial Department of Environment (PDOE), Provincial Department of Agriculture, Forestry and Fisheries (PDAFF), and community association) working in the related field. The objectives of the training were: 1) To introduce and disseminate the REACT projectto relevant stakeholders; 2) To discuss on the climate change issues at HEIs; and 3) To build more capacity of the lecturers, officials from different institutions and students on the climate change. The national training was chaired by Mr. Pin Tara, Vice-Rector of UHST. He gave his appreciation to all the participants and expressed the concept and related topics on climate change issues at HEIs. The eighty-two participants were invited to join the training. The topics covered impact of climate change on sectors, results of In-depth analysis of the current status and needs of PCs in terms of R&D in Climate Change, Cambodia climate change strategic plan and disaster risk management strategies, and Institutional framework on climate change. Finally, the presenters presented the above topics, including the case studies. They also jointly discussed with group division from different stakeholders on climate change issues at HEIs. The comments and feedback were raised during the result sections.